SUNNY SPELLS ARE often associated with water shortages but the current warm weather has seen Irish blood stocks fall sharply. The Irish Blood Transfusion Service has appealed for donations via twitter to ensure supplies don’t run too low. 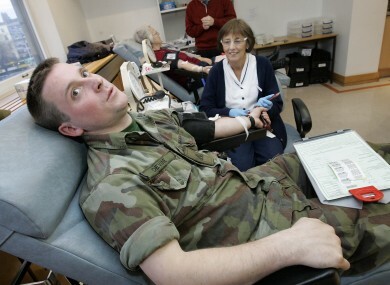 Andy Kelly, Chief Executive of the Irish Blood Transfusion Service, told TheJournal.ie that donations were down approximately 26 per cent on an average day at this time. Currently the IBTS has a four-day supply of blood but they would like to have seven days in the bank. Summertime is always difficult for the the IBTS but this Kelly says this summer in particular presents challenges. Another issue is the upcoming European Football Championships – in particular on the days that Ireland will be playing. Those days we’ll see a drop. Then there’s the Olympics which will affect donations also. Mr Kelly says the Leaving Cert and Junior Cert means households are naturally busier and people who’d normally donate don’t have or take the time. For those who are squeamish, Kelly recommends coming with a friend and stocking up on plenty of fluids prior to and during their clinic visit. One in four of us will need a transfusion in our lifetime and we shouldn’t leave it to somebody else to donate. You can check the current blood supply, who can donate and the opening hours of your nearest clinic at www.giveblood.ie. Email “Numbers giving blood drops due to hot weather”. Feedback on “Numbers giving blood drops due to hot weather”.